Wow 56 issues of a self published magazine, or fanzine to me and you. I’ve written a few different zines since my first, Whose Life Is It Anyway back in 1984 when Suspect device was just starting. Here they are 30 years on and still as keen and enthusiastic as ever. The best thing about fanzines is there is nearly always a new band on the receiving end of lavish praise that makes you want to go and check them out. After Suspect Device I have a whole list for my next internet search. 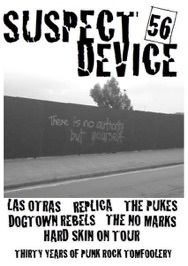 Good interviews with Las Otras, Replica, The Pukes, Dogtown Rebels, The No Marks and a piece on Hard Skins American tour. That, along with the music reviews would have been enough for me but the best is yet to come. Tony and Gaz asked a few people the same questions, When did you get into punk rock, what was its appeal, when did it become more than just going to gigs and buying records, what are your highlights, how has punk changed your life, has it influenced you and what motivates you to stay involved. All make great reading and I would love to read more. Maybe they can make it a permanent fixture. That I would love to see. This movement has had such a profound effect on so many people, their stories are always good to hear.